VBMS, a subsidiary of Royal Boskalis Westminster N.V., specializes in the installation of subsea, umbilical, risers, flowline (SURF) components, and subsea power cables and interconnectors. VBMS offers clients an integrated package of solutions and collaborates closely to understand the project’s particular goals and objectives. Throughout the entire process, the company eliminates time-wasting interfaces to increase overall efficiency. VBMS has a team with a wealth of knowledge and experience in the offshore industry, combined with a dynamic and energetic, dedicated philosophy. The company’s in-house engineering department of skilled engineers creates complete subsea solutions. VBMS utilises state-of-the-art technology to develop products and maintain consistent quality control. It is the company’s focus on expertise and quality that has given it a reputation for delivering solutions on time and within budget. VBMS is committed to reliable quality, health, safety and environment (QHSE) principles, which represent a key driving force behind a continually improving business. VBMS has created an effective safety culture, with full cycle feedback and monitoring, including management support / involvement that aims to improve safe conditions and encourage proactive behaviour. The company aims to eliminate QHSE hazards at the source and/or reduce them to as low as practicable. VBMS sets measureable quality control processes for its clients. The company’s integrated QHSE management system is used for all operational work to ensure processes are performed safely, efficiently and effectively. The company includes and supports this with periodic, external expert-led system audits to ensure continued compliance with QHSE standards. A major measure of the VBMS’ success is meeting, and often exceeding, strict requirements set by the marine industry’s regulatory bodies, including the ISO 14001: 2004, ISO 9001: 2008, OHSAS 18001: 2007 and VCA: 2008 5.1 QHSE certifications. VBMS works proactively to offer clients an integrated package of solutions. The company works as a project partner to deliver the desired outcome. Throughout the entire process, VBMS removes time-consuming interfaces to increase overall efficiency. The company’s focus on quality with cost effectiveness yields consistently high results, while concentrating on safety mitigates risks. VBMS has the experience, technical expertise and solutions for all offshore SURF projects and challenges. Offshore SURF installation specialist VBMS is to attend the forthcoming Subsea Expo 2016 in Aberdeen, UK. VBMS, a strategic joint venture of VolkerWessels and Boskalis, has successfully completed the offshore installation of an 18.5km control umbilical for Wintershall Noordzee B.V. 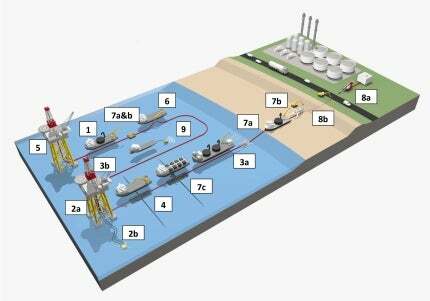 The umbilical connects platform RAVN to A6A, located in the Danish and German sectors of the North Sea. VBMS has been awarded a contract by E.ON for the installation of two 16km-long export cables for the Rampion offshore wind farm.